For the love of life: JustRite Papercraft's April Release day 3! JustRite Papercraft's April Release day 3! Good morning again and welcome to day 3 of JustRite Papercraft's April Release! We are so excited to share with you the pretty projects created with all these beautiful stamps and today is no different. I am so excited to share with you this card, as I love everything about it. I combined two brand new stamps and not one, but 4 different Spellbinders as well. Talk about overload...LOL, but I love my shapes and the new JustRite stamps beg for them. So this card was created using one of the newest lace borders called Classic Lace Edges Two. 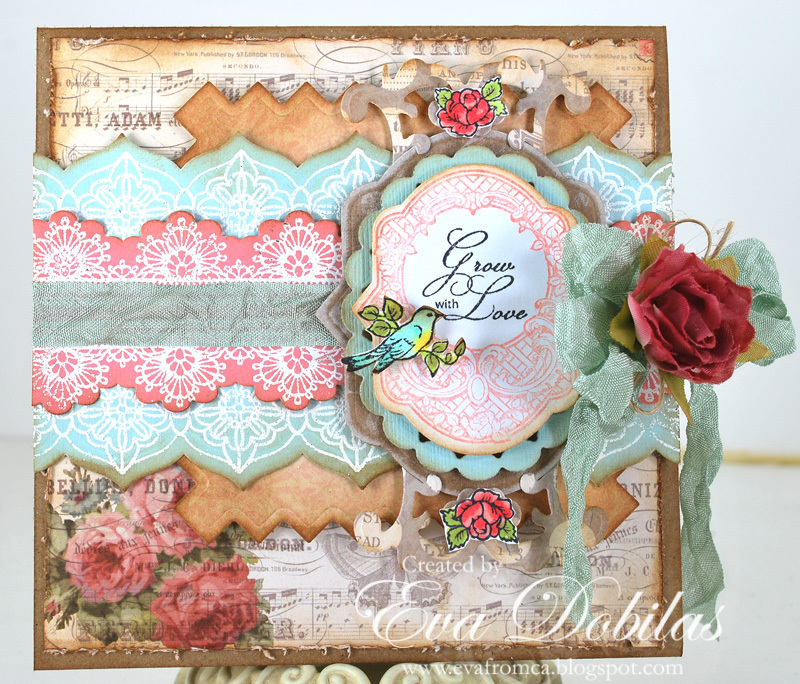 These borders are very yummy, and what I love is that they coordinate with Spellbinders Edgeabilities Classic Lace Edges Two, so I can create really beautiful, always perfect lace borders. In my card I also incorporated another brand new stamp called Spring Rose Medallions, which is another beauty in my humble opinion, but I let you be the judge of it! Papers I used are by Prima. To create my card I used a few more Spellbinders. Here is the list of them, just in case you would like to own them. So let me show you the two brand new set of JustRite Papercraft's stamps I used on my card today. This week we are revealing a fresh new look for JustRite Papercraft and launching the beginning of a new stamp line called Amy Tedder Designs and Amy is launching a new blog called Amy Tedder Designs. You can see the entire release on Amy's Blog today!! To help Amy celebrate the launch of her new line we are giving away a Fab Blog Candy Prizes. Leave a message on Amy's new blog telling her what your favorite JustRite Stamp set is and for every 100 comments she gets we will pick a winner who will receive the entire April Release - that's 8 Amy Tedder Design stamps sets for free! And make sure you hop on over to all the participating designer's blogs as they have some truly beautiful and inspiring creations waiting for you, trust me!!! Here is the list of participating ladies for today. Thank you for visiting once again and I will be back tomorrow with more goodies, so stay tuned!